This addon enables focused farming or leveling by filtering repeatable quests received by certain quest givers. At the moment, I am supporting the Dark Brotherhood and Thieves Guild repeatable quests obtained through the Marked for Death and Tip Board, respectively. 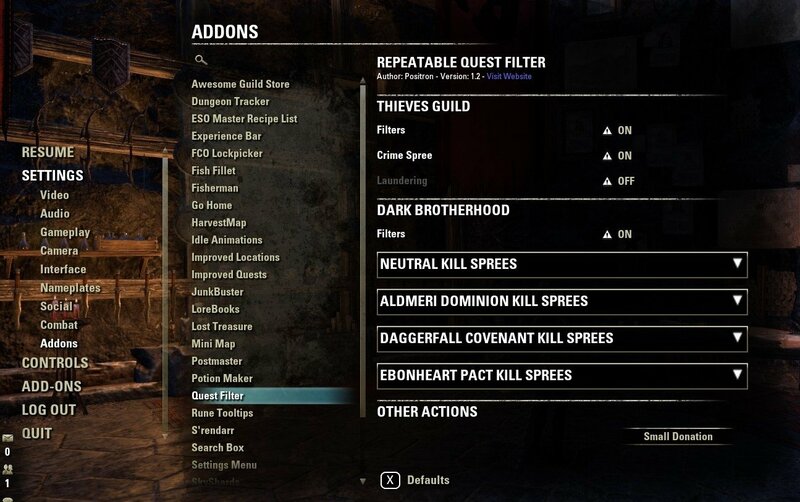 Simply spam "E" at the Quest Giver to allow the filter to only accept the quests according to your criteria. If you experience a bug or have any feature requests, please let me know in the Issue Tracker on the Github Repository. Since this is my first addon and first time playing Elder Scrolls Online, there will likely be much more to be desired, so don't be shy. Thanks for this. I was using 2 others that do this but neither was configurable. I was having to try and modify them to only show me the specific ones I want to see. This one works even better. 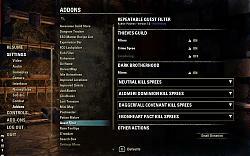 Can you get the game to skip the first page of the DB "Marked for Death" book so it goes directly to the actual contract dialog? I know it must be possible to do this because other addons like lazy writ crafter are able to select dialog entries (to accept/turn in writs). If you like this Addon because it saves you time, builds your skill lines quickly, and/or makes a fair amount of quick Gold in-game, shoot some appreciation mail to @PositronXX.